BLANCO HORIZON stainless steel sink engineered to precise specifications for quality and performance, offering unmatched value. This double bowl drop-in sink is made of 80% natural granite and features a unique design to enhance bowl shape and capacity. 4 additional knock-out holes are provided for accessories. 3-1/2" stainless steel strainers are included. Available in store by Special Order Only. See associate for details. 8 In. Double Bowl Stainless Steel Sink BLANCO HORIZON stainless steel sink engineered to precise specifications for quality and performance, offering unmatched value. 8 In. 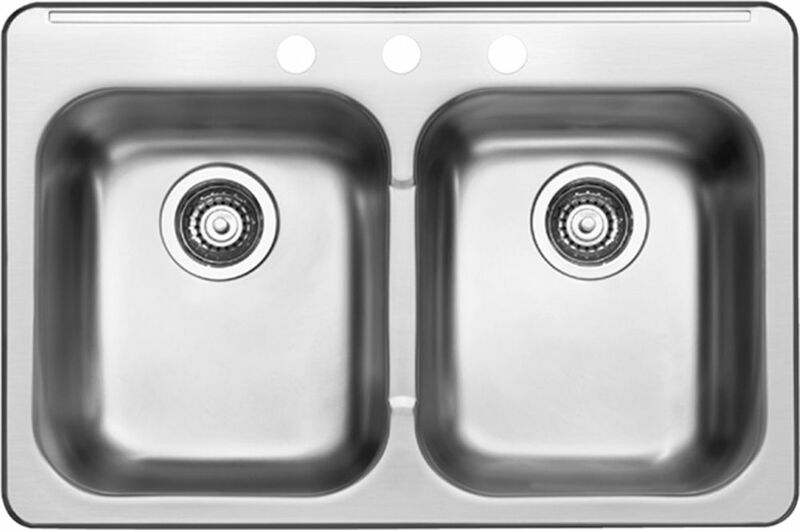 Double Bowl Stainless Steel Sink is rated 1.0 out of 5 by 3. Rated 1 out of 5 by csc65 from Poor quality for the price Put baskets/plugs on the top of the back of the sink like most people. Chemical reaction occurred under each that has left the sink permanently stained. Does not come off with Vim, etc. Also sink always looks dirty/stained, even though it is clean and little used (have dishwasher). Do not buy this sink. Will try and get this resolved via warranty...will see how they respond. Rated 1 out of 5 by RandomPerson from Bad plugs!! Waste of time. Always test a sink or a tub before installing it. I learned that the hard way. So I assembled and set this up outside. I filled it up to see if the drains leaked under pressure. They did! Now the drain assembly was fine. They're made mostly of plastic, but I'm fine with that. All the seals held just fine. It was the plugs. No matter what I did, they constantly leaked water. I double checked the manual (that I read before assembling) and everything was done right. With everyone being so crazy about eco-friendly and saving water, I was very surprised. I took out the plugs to look at them and the rubber seals are very thin. Take a look at nearly any other drain plug and the seal is a good 1 cm tall. These are a good 2 mm tall at best. I could have bought new plugs and/or new drain assemblies for it but why? It's a NEW sink... shouldn't it work??? Nice job Blanco... save 0.25 on the seals and lose a sale! I took it back ASAP. I was VERY glad I didn't install it! Rated 1 out of 5 by cattm from Sink does not reflect quality that it should be I bought this sink less than a month ago and have had it in place for 21/2 weeks. I am very disappointed at how easily it scratches. With nothing but gentle care, as it is only my husband and I, the sink scratches with the littlest touch. I researched what was a better grade of stainless steel thinking that this would be an improvement over my old sink and paid what I consider a more expensive price but I feel that I should have just bought a cheaper sink because this one is completely disappointing. I wouldn't recommend it at all.